Microsoft is clearly taking its time while developing these apps, so don’t expect the ‘preview’ tag to be dropped anytime soon. Furthermore, you can’t just go to the Play Store and install Word, Excel, or PowerPoint. First, you have to join the Office for Android community on Google+, then individually decide to “become a tester” for each of the three aforementioned Office apps (if you want them all, of course – otherwise, just choose the appropriate one from the community page). After you agree to that, you will finally be presented with the familiar download option in Google’s app store. You also need to keep in mind that these Office apps may be geo-restricted in some way, so you may not be able to install them (or even ‘become a tester’), depending on where you are in the world. This convoluted procedure is in fact using Google’s tools for pushing ‘beta’ apps to the Play Store, so it’s clear that Microsoft thinks Word, Excel, and PowerPoint for Android phones are still very much a work in progress. However, you can already read and edit documents, as well as insert charts, text, and tables in Excel. 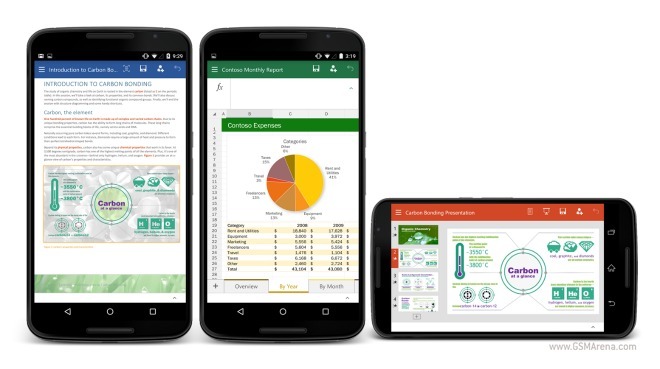 In PowerPoint, you’re able to present straight from the phone. The design of the apps keeps in mind the fact that you’re on a phone, and as such the ribbon options are presented at the bottom of the screen so they’re easily reachable. Creating, opening, and saving stuff to the cloud is possible too, regardless of whether you want to use OneDrive, OneDrive for Business, SharePoint, Dropbox, Google Drive, or Box. Sharing is in, letting you work with others, while Microsoft says it would appreciate feedback on the apps in their current state.